I am going to go with a theme here- favorite comfort foods. My ultimate favorite comfort food is risotto. I call it grown-up mac 'n cheese. What I like most about risotto is that it is SO versatile! You can add just about whatever you would like to it. But good risotto does require patience. It takes a while for the chicken broth (or veggie broth) to be absorbed by the rice, plus you have to park yourself by the stove for about an hour. But it is so worth it! Here is a link to my very own Summertime Risotto recipe- click here. 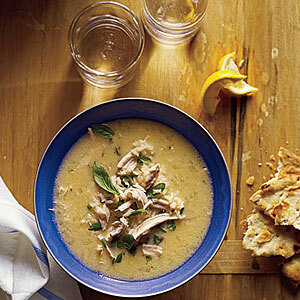 For snowy winter evenings or a rainy day, I love to make Avgolemono Soup- a Greek chicken lemon soup. My favorite recipe for it also happens to be a Cooking Light recipe (healthy too!). Click here for the recipe. I am going to have ti check out that soup, it sounds delish!! May have to try that risotto!